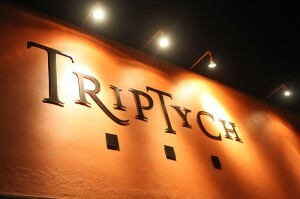 On Friday, March 26th, táami berry hosted an event at Triptych Restaurant to celebrate the launch of our new website: taamiberry.com. Over 60 guests were in attendance to enjoy the evening with an array of hors d’oeuvres, good company, and the sweet experience of the táami berry. From buffalo wings to complimentary glasses of champagne, guests had the opportunity to sample tasty foods and drinks both before and after consuming the táami berry. The evening was charged with excitement and anticipation from the moment guests began lining up outside of Triptych- promptly at 9:30 pm. By 10:15 the imaginations and taste buds were being warmed up as guests sampled lemon wedges, fruit kebabs, an array of yogurts and more. Next, the táami berries were presented on a bed of ice cubes and simultaneously given to each guest. Guided by specific yet new instructions, guests moved their miracle fruit this way and that across their tongues “making sure to coat the entire area”. Then, as if the flood gates had opened, guests poured and packed themselves around the sampling tables with one thing on their minds- let’s see what this berry can do! Amidst oooh’s and awww’s, ecstatically surprised partakers handed their favorites to others making sure that the creamy greek yogurt and chocolatey beer were not merely a figment of their imaginations! The event and residual socializing lasting longer than expected, left Triptych, first timers, and taami berry sweetly content! Look out for future events and make sure to get on the list before it fills up!